Pinterest introduces new feature, now you can see more information on the pins like pricing and availability of products such as clothes and gadgets, cooking and baking the ingredients, content renting and rating the movie. Starting now users can see more information icon that appears below of some pins. Pinterest worked with some popular websites like Sony, ebay, Walmart, MyRecipes, Netflix etc.. to show more information on some pins. 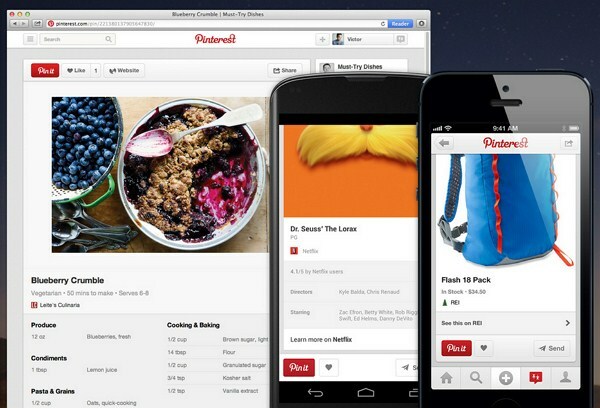 And these features available for Pinterest new look only. And also Pinterest adds Pin It button available in mobile apps, so you can pin on wherever you are from your smartphone and tablets.